How do you get rid of musty odor in car's vent? I notice a musty odor in my car...usually worse when I initially turn on the vent. How do I get rid of this odor? Is there a simple spray that I can direct into the air recycle port? Re: How do you get rid of musty odor in car's vent? I have been told to clean out the air filter then somehow place a couple of fabric softener near the vents. Or hang a couple of freshly brewed tea bags of your flavors by the vents. Haven't tried any myself. I will try the tea bags and fabric softener...I have easy access to my cabin air filter. I just read up via google. I think I have a mold issue. It started recently...and makes sense. NYC was really hot and humid this summer. Replace the air filter, vacuum the vents, run a brush or one of those duster gizmos as far into the vent as you can. Of course you're dealing with a moisture build-up in the system, and some sort of mold has grown in there. It's tough to get out. Be careful what you spray in there... a car is a very small space, and you can compromise your lungs very quickly if you shut the windows and get a faceful of some weird stuff. Hey, try it at your own risk of having tea addicts sniffing at your car! buildup and that's where the musty smell usually comes from, condensation. You could also spray Lysol into the A/C & vent intake on the outside of the vehicle with the vehicle running and the fan on high. It's usually between the windshield and the hood. It's probably just filth accumulating on the evaporator or condenser for the A/C. Any decent auto shop should clean it with a foaming detergent for $20 bucks or less. My dealer comps it with an oil change. It's also possible that bacteria have colonized your A/C pipes or your carpeting. If the foaming cleaner doesn't do the trick then they should be able to use a "bomb" (like a bug-bomb or fogger) to clean out the whole interior at once. Note that the real problem is likely the location that you park your car, so if you can't find a cool, dry, well-ventilated place then having the evaporator cleaned or the inside "bombed" may become a yearly ritual. Sometimes it's just a run of bad weather or a lack of refrigerant at fault, but usually it's the stinky filthy air in a parking garage that causes the problem, leaving a layer of organic gunk on your engine that gets sticky in the moist areas of the air conditioning system and cultures a thick layer of mold or bacteria. Number one I would check is if the drain line for the AC is plugged. I had water sloshing around in one car and it started stinking. 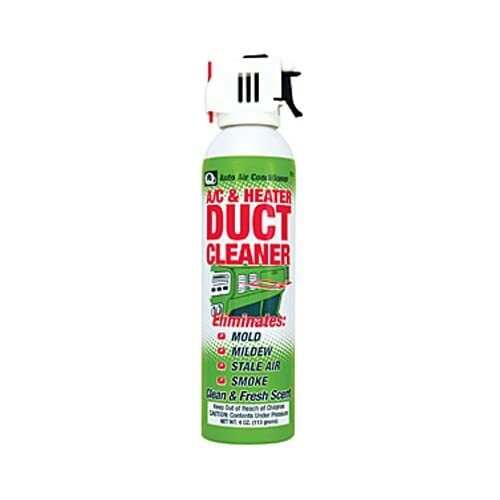 If it does not have a filter to change, some mechanics have special cleaning/disinfection foam that fills the interior of the heater/AC and then drains. Cape Cod was so hot and humid this summer that I had mold growing on the OUTSIDE of my car! I've also noticed mold growing on the outside of other cars around here. My car is white and was covered with black mold spots. Took lots of elbow grease and the assistance of my husband to get it white again last weekend. Never saw anything like that before, except on my boat once, after it had been covered with a canvas tarp. The car wasn't covered, or parked in a garage. This has been the hottest, most humid summer I can recall. My thought exactly! Leaves and general schmutz can clog the AC drain line and cause the car to have a distinctly funky smell inside. The "quick & easy" way to test for this is to turn the AC on "Max" while the car is parked and look for water dripping out from under the passenger's side behind the front wheel. No drip usually equals clogged drain tube. If it is clogged, try GENTLY inserting soft wire (like aluminum solder) into the drain tube... chances are when you contact the clog, you'll start getting stinky water flowing out of the tube so position yourself accordingly. If your car has an AC filter (some do, some don't) and you can't recall the last time it was changed, then it's time for a new one. The one in my Mom's Subaru was filthy and almost completely clogged, and the difference a new filter made in both airflow and AC effectiveness was dramatic to say the least. I once did what Sydric suggests and it worked well. At your local grocery store, drug store, and megamart you can buy these little deodorant buttons that clip onto the vent blades. Which is like putting on cologne when you haven't bathed in a week: The best you can hope for is that it will mask the problem; It will not solve the problem at it's source. Edited 1 time(s). Last edit at 09/05/2010 10:24PM by Thrift Store Scott. ...The best you can hope for is that it will mask the problem; It will not solve the problem at it's source. Car Talk has a brand that they recommend, though I can't find it at the moment. I think they mentioned it two or three shows ago. This article leaves the brand name out. Hmm, I just tried to d/l #1034 and they charge 99¢ for it. So, if you subscribe and KEEP it it's free. But if you let it delete, it'll cost you. Odd. I cannot stand those things. They are waste of money. Just leave the windows open. Wife scatters sachets of dried Lavenders in her car. Or your local Kragen/O Rielly auto parts store. And change your in cabin filter. Edited 1 time(s). Last edit at 09/06/2010 05:43PM by Carm. It removes odors without masking them! Typically, you have to get in closer to the condenser in the system, which means gaining access to the rear part of the venting system closer to the firewall. It's not an easy task which is why I did not do it although I had much the same issue (mold and/or mildew smell) in my car. The stuff that Joe posted would be good but if you spray it only in the vents in the interior, won't do much good.